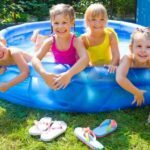 While most of the time sliding into a pool is going to be fun, it can be a hot experience as well when the sun has been beating down on the pool for hours on end. This is when people tend to avoid going to the water slide at all because of the heat that is building up on the slide. 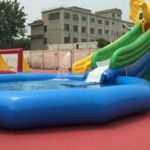 However, avoiding this slide all the time can make the pool boring, but to avoid the heat burn some people will use an inflatable water slide for their pool, that they can take up and down. This is when people should use some tips to ensure they select the right one for their pool. 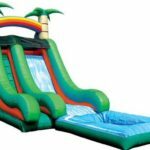 Amount of air that the slide is going to need to be properly inflated is one of the first things that people need to look for when they are getting these. 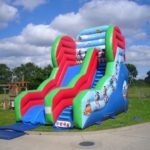 While most of the time people never think about this, they need to realize these slides can take quite a bit of air and if they cannot blow it up on their own, they may need to get an air compressor hooked up on them to blow it up. So this is the first thing that people need to consider. Height of the slide in relation to the size of the pool is something else to consider. 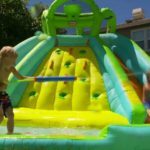 When people are getting a water slide they want one that is going to put them close to the center of the pool, but not to far into the pool. 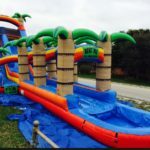 However, at the same time people need to find a slide that is going to be tall enough for them to enjoy the slide instead of just sliding a foot and hitting the water right away. Durability of the slide is a great thing to look for. This is often going to be found by reading various reviews, but it will make a difference in how well the slide is going to wear with the pool. but also in how long it last before needing repaired. 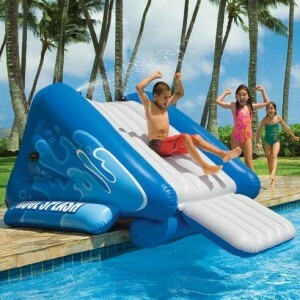 Remember the slide will be going over the metal or inflated side of a pool. 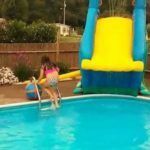 As many people have found out getting a slide for their pool is more of a challenge than they thought. Plus if the slide is to hot because of the summer sun it generally sits unused. 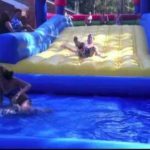 This is when people should know some tips to help them, in getting the best inflatable water slide for their pool.